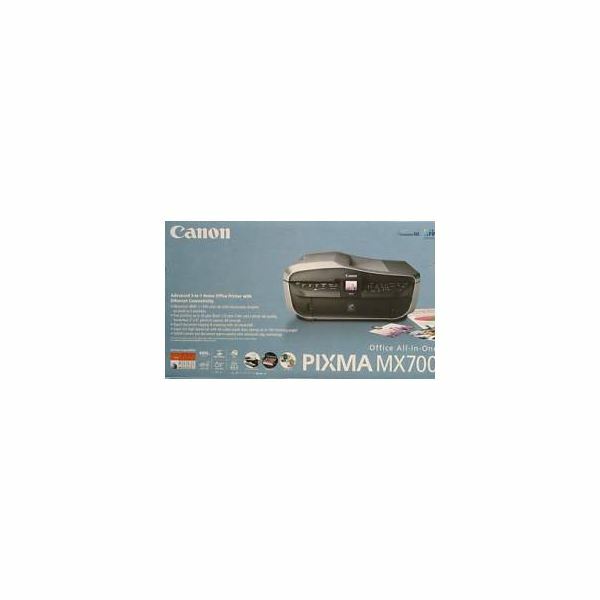 The Canon Pixma MX700 offers cutting edge pixel resolution for hobby and professional photographers alike. In addition, this multifunction printer can be used for faxing, scanning images and printing everyday business letters and advertising items. Canon’s family of Pixma printers has grown in popularity as users see the sharp, clear images created by these machines. This particular model offers several features in one: print, fax, copy, scan and photo printing. The printer is inexpensive, prints high resolution and runs quickly and efficiently. Two separate paper trays can hold either photo or regular paper. Photos are scanned and printed in 2400 dots per inch (dpi) in color making for crisp, photo shop quality portraits. You can also fax in color or black and white. Offers the ability to print front and back by moving the paper manually, but no duplexing function. Ethernet port and networking capabilities. Automatic Document Feeder (ADF) holds 30 sheets for scanning or faxing. Ink costs are reasonable at about three cents per page for black and white and six cents per page for color. Limited fax capabilities. You cannot set the fax to send later and incoming faxes are stored in memory. The only way to limit spam faxes is by unplugging the fax from the phone cord. Ink cartridges cannot be recycled. Duplex printing is manual only. The MX700 can be easily found for under $200, although the price varies greatly depending on where you purchase the printer. Add to that the fact that the cost of printing a black and white page is around three cents and a color page around six cents and you can easily see that this printer offers great value for the money.